Problem: An old oil boiler in a church in Boiling Springs PA was breaking down a lot. The cost of oil was also very high. Solution: Performed an oil-to-propane conversion. Replaced the oil boiler with a Crown PhantomX modulating propane boiler. 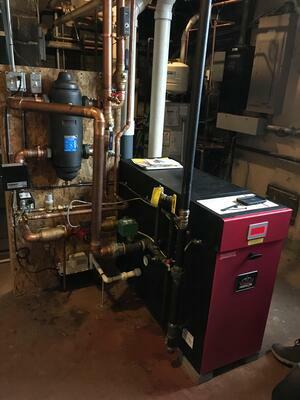 A church in Boiling Springs PA, near Harrisburg, recently had the opportunity to convert from their old oil fueled heating system. Their old oil boiler was breaking down a lot. Boiler repair was getting costly. At the same time, the boiler’s regular expenses were increasing. As the price of oil continues to rise, it costs more money to heat the church and attached classrooms. So, the church considered replacing the boiler instead of fixing it yet again. They also thought about switching to a different heat source. For this job, they called UGI Heating, Cooling and Plumbing. We’re known throughout the region for high-quality HVAC work. And, we’re experts in oil-to-gas conversion. UGI HVAC Comfort Consultant Todd Ranson met with the church officials, toured the grounds and inspected the boiler. Then Todd came up with the solution that saves them money in the long run. Problem: An old oil boiler in a church in Boiling Springs PA, near Harrisburg PA, was breaking down a lot. The cost of oil was also very high. Heating with oil is more expensive than ever. That’s been the biggest driver for people to consider switching sources. Additionally, using oil as a fuel source is dirty and requires frequent maintenance and cleaning, a dirty and expensive process. Add to that the fact that the church was incurring frequent, high repair bills, and the idea of conversion looked more and more attractive. As Todd Ranson of UGI Heating, Cooling & Plumbing explained to the church officials, when considering a switch from oil to gas, there’s more to consider than just fuel costs. An HVAC conversion is a big undertaking. We always make sure our clients understand all the possible downsides along with the benefits. First, of course, there’s the cost of a new heater. But, you also have to get rid of your old one. And, when it comes to an oil boiler, that’s a job in and of itself. There are many state and federal regulations for oil boilers. They must be removed if they’re not in use. Even if the unit is underground, you can’t just leave it there. Then, it also has to be disposed of properly. Fortunately, UGI Heating, Cooling & Plumbing is very familiar with this process. Todd made sure to guide our client through this process and its cost. And, he coordinated everything from beginning to end. With UGI HVAC, there’s no worry about removing the tank or getting it where it needs to go. And, our clients never have to worry about fines, leaks or other problems down the line. Another big factor is whether or not gas lines are available in the area. There are many rural areas in Pennsylvania. Not all of them are serviced by natural gas lines yet. That, in part, is why oil was so common for so long. 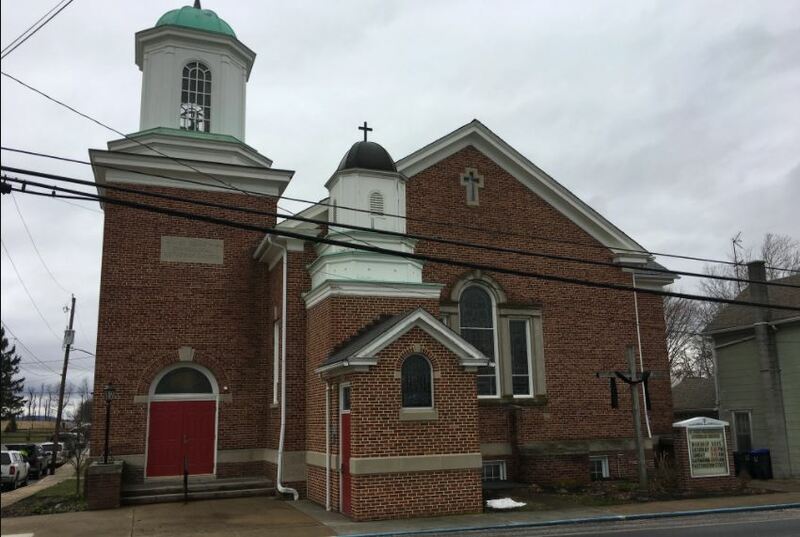 Unfortunately for this church, natural gas mains were not close enough to their location to get natural gas service. So Todd looked at the next best option - propane. Propane has many of the same benefits of natural gas, especially when compared to oil. Like natural gas, propane is a clean-burning, better-for-the-environment option. Todd made sure to review all these factors with the church. They understood the costs involved with getting rid of the old burner. And, they knew we would take care of everything for them. With that all set, we were ready to go. With all that figured out, the church was ready to overhaul its heating system. They went with a PhantomX Velocity propane boiler. This helped save even more money. The PhantomX is one of the most efficient boilers on the market today. For starters, it’s Energy Star-certified. That means it meets government requirements that show it uses less energy than similar boilers. And, it surpasses those minimum requirements. This boiler has an Annual Fuel Efficiency Rate, or AFUE, of 95 percent. The AFUE measures how much energy a heater actually puts toward heat versus how much gets lost in exhaust. It’s common for older heaters to have AFUE’s as low as 70 percent. In those cases, thirty percent of the energy a person pays for — gas, oil, electric, etc. — doesn’t actually get used to heat the property. This boiler, however, loses just 5 percent of its energy in exhaust. That means almost all of it goes right to warming up the church and classrooms. The church began seeing savings immediately. Their energy bills dropped a full fifty percent! They went from $2,000 a month to just $1,000. On top of those savings, they also don’t have to worry anymore about the furnace breaking down. That means more comfort and less money for repairs. Switching from oil to propane was a big investment. But, the church is already seeing monthly savings. Soon the switch actually will pay for itself. Are you considering a switch from oil to gas or propane heat? Contact us to find out more about the process and how it can greatly reduce your energy bills.